These cookies taste just like the ones I used to have growing, they came from a small bakery in my Connecticut hometown. 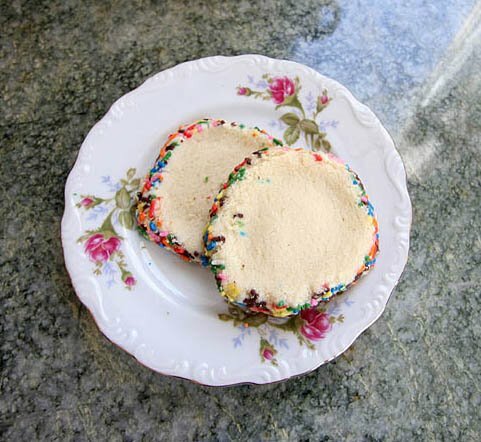 They’re crumbly, and kind of taste like a salty sugar cookie. They’re made with shortening (I used non-hydrogenated organic) and they’re affectionately know as “crack cookies” in our house because they rarely last more than a day. They’re that addictive! Using a stand mixer with a paddle blade on low speed, cream together the shortening and sugar. Add one egg and the vanilla, then beat on medium speed, until light and fluffy. Combine the baking soda, flour, salt, and cornstarch in a separate bowl. To measure one cup of flour, add 2 T cornstarch to the bottom of a 1 cup measure, then fill the rest with flour. To measure a half cup of flour, add 1 T of cornstarch to the bottom of a 1/2 cup measure, then fill the rest with flour. Set your stand mixer to stir, and mix the flour mixture into the shortening, etc. until combined. Roll the dough into 2 logs, about 7-8 inches long (for smaller cookies, make them 10-12 inches long). Wrap the dough in plastic wrap and refrigerate it for about 30 minutes. Unwrap the dough and cut it into 1/2″ slices. If you refrigerated it for longer that 30 minutes, it may need to sit out for a bit before you can slice it without it crumbling. Set the slices an inch and a half or so apart on a greased cookie sheet. 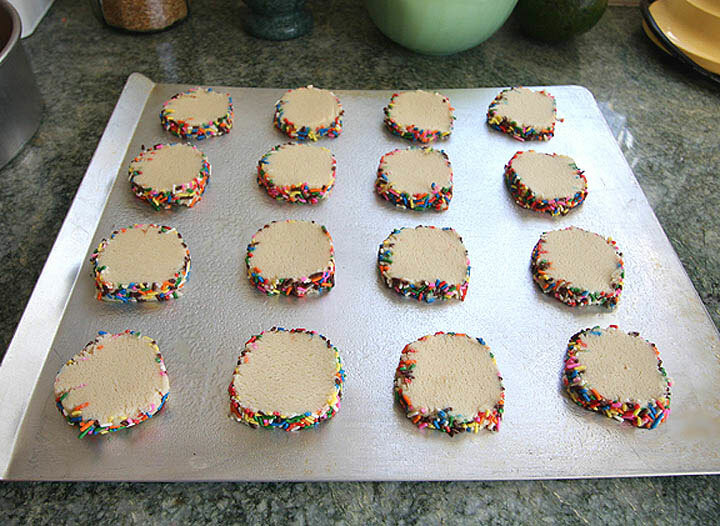 Bake at 350 for 12 – 15 minutes (shorter for smaller cookies), or until the middle has set. Let them cool on cookie sheets for a few minutes, then transfer to wire racks. yummy, thank you. I’ve never done that thing with the cornstarch, just curious as to why we should do this? Unfortunately I don’t have a stand mixer (yet.lol) so I will be making mine in my big old bowl. hehe. The cornstarch/flour combo is a substitute for cake flour. Alternately, you can use 3 1/2 cups of cake flour, and omit the cornstarch. I prefer to keep all purpose flour on hand and supplement it with the cornstarch. For me, doing it this way comes out to be less than half the price of buying cake flour. The cookies will still turn out if you use all purpose flour without the cornstarch, but the cake flour substitute gives them a nicer texture. Wow…not only do these sound delicious they are pretty too!